Also serving communities of Simpson, Forest City, Bethany. There are 6 Assisted Living Facilities in the Carbondale area, with 3 in Carbondale and 3 nearby. To help you with your search, browse the 10 reviews below for assisted living facilities in Carbondale. Better rated regions include Clarks Summit with an average rating of 4.1 out of 5 stars. Caring.com has helped thousands of families find high-quality senior care. To speak with one of our Family Advisors about assisted living options and costs in Carbondale, call (855) 863-8283. Carbondale, Pennsylvania sits in the northeastern part of the state, less than 20 miles from Scranton. The nearby Moosic Mountains and Merli-Sarnoski Park Lake offer seniors residing in assisted living communities many recreational opportunities. All assisted living facilities in Pennsylvania must obtain licensing through the Department on Aging, and assisted living residences are divided according to what type of housing units they offer, along with what level of services are provided. Seniors looking for an assisted living community will find three in the city and another 22 in the area. One of the advantages seniors in Carbondale enjoy is the low crime rate. Compared to the nation, the city ranks 17.4 lower in violent crime and 14.7 lower in property crime. Carbondale also experiences lower crime rates than the state average. The city gets around 66 inches of snow each year and sees a winter low of around 14 degrees, and the bitter climate of winters in Carbondale can take a toll on vulnerable seniors. The Carbondale area is home to world-class medical facilities, including Carbondale General Hospital, in the event of medical emergencies or illness. Tax rates in Carbondale are beneficial to its senior residents. Besides having a sales tax and income tax rate that is nearly the same as the U.S. average, the state of Pennsylvania does not tax any income from Social Security, 401(k)s, or IRAs. Pennsylvania also exempts pension income from taxation for residents age 60 and over. COLTS provides a selection of public transportation options for residents of the Carbondale and Lackawanna County area. Seniors can ride for free when they visit the COLTS office and get a state transit ID card. Carbondale's cost of living index ranks 19 points below that of the nation. Seniors will pay about the same as in the rest of the state and nation for health care, but grocery rates in Carbondale are 9.1 points lower than the state average. Assisted Living costs in Carbondale start around $0 per month on average, while the nationwide average cost of assisted living is $4,000 per month, according to the latest figures from Genworth’s Cost of Care Survey. It’s important to note that assisted living rates in Carbondale and the surrounding suburbs can vary widely based on factors such as location, the level of care needed, apartment size and the types of amenities offered at each community. 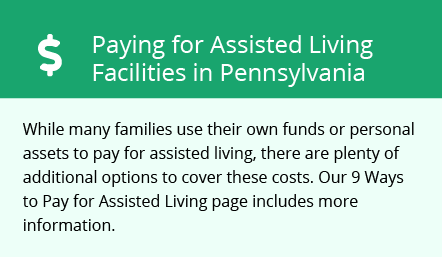 Pennsylvania does not provide for assisted living services through either the Medicaid State Plan or any waiver program, but the state does add to the Supplemental Security Income (SSI) some seniors may be eligible to receive. Carbondale and the surrounding area are home to numerous government agencies and non-profit organizations offering help for seniors searching for or currently residing in an assisted living community. These organizations can also provide assistance in a number of other eldercare services such as geriatric care management, elder law advice, estate planning, finding home care and health and wellness programs. To see a list of free assisted living resources in Carbondale, please visit our Assisted Living in Pennsylvania page. Carbondale-area assisted living communities must adhere to the comprehensive set of state laws and regulations that all assisted living communities in Pennsylvania are required to follow. Visit our Assisted Living in Pennsylvania page for more information about these laws.